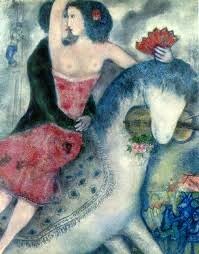 Marc Chagall (born Moishe Shagal) was like the Forest Gump of 20th Century Europe, a real life Zelig. He lived through the Russian Revolution, narrowly escaped the Nazi attempt to extinguish Jewry, painted next to the most celebrated of modern French painters, and even designed costumes and sets for operas in New York when America was making its ascendency. The Tokyo University Museum is currently hosting Chagall and the Russian Avant-Garde, a collection from the Centre Pompidou. It’s a remarkable collection. 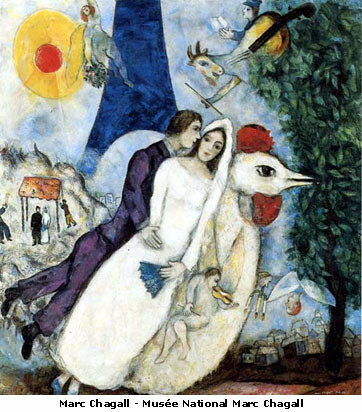 In contrast to to the Magritte exhibit, which made you slog through galleries of middling Belgian artists before you got to a trio of disappointing Magritte works, the Chagall exhibit is like a reverent temple to his art. 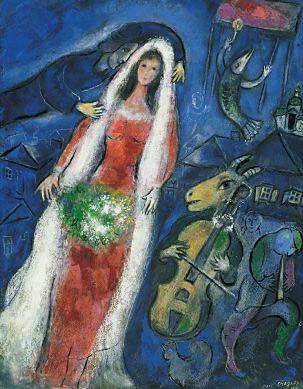 About half of the pieces were by Russian contemporaries that gave context to what Chagall did. I admit I felt impatient to move on from them. But it’s nice to see him in context, to fully appreciate how original he was, and how thoroughly unpretentious his works are. After a few hours of viewing his art, I couldn’t help but smile at the joy he put into his paintings. Whereas his colleagues were mostly concerned with technique and painting serious subject matter. As I went through the exhibit and having learned a little more about his life, it was hard to think of him as little more than a pampered spoiled socialite. Of course there were tragedies in his life, like how his hometown was reduced to almost nothing by the end of World War II. But he himself was largely celebrated and loved and was constantly surrounded by supportive colleagues and benefactors. By the end of the exhibit, when a gallery of his wall to ceiling masterpieces were on display, I came to realize that not all great artists have to be tortured. They are entitled to a comfortable life like the rest of us. Joy and a lightness of heart can also be deep. There are tortured dark themes in his art to be sure. But they are literally lifted upward, or left far behind on earth. His vision is single-mindedly pointed towards the past, almost to a point of obsession. He repeatedly paints his childhood village in Belorussia. The ghosts of his loved ones are always floating about his scenes. And especially poignant are his recurring portraits of he and his late wife, drifting forever towards an idealized past, over the streets of his innocent youth and a naive Europe. The exhibit runs to October 11. 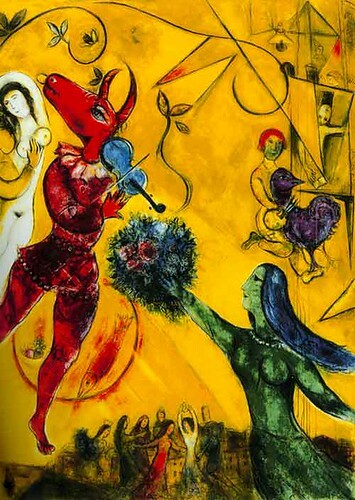 If you’re a fan of Chagall, this is about as good as it gets. His full size paintings are stunning, and the museum did an impeccable job of displaying them. At 1,500 yen it’s a bit spendy even for Tokyo. The museum cafe is disappointing. But it’s in Ueno Park, which is always a plus. Here’s the English language link. Next Next post: Free Fish!